The following software is required for this tutorial. 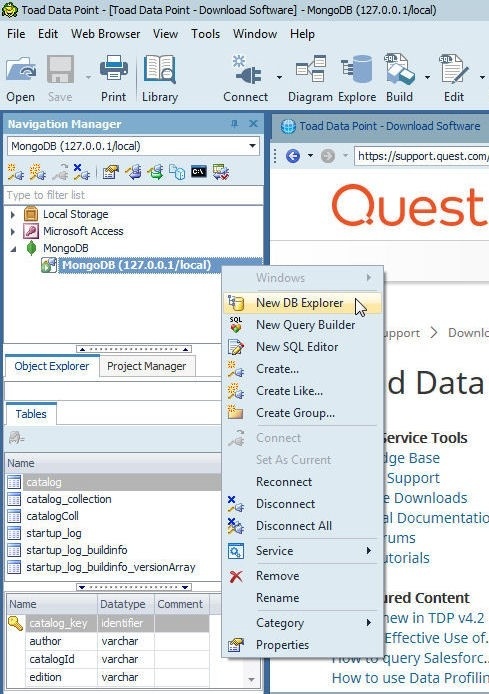 Download the toaddatapoint_pro_4.1.0.226.exe application from https://www.quest.com/products/toad-data-point/ and double-click on the .exe file to install Toad Data Point. 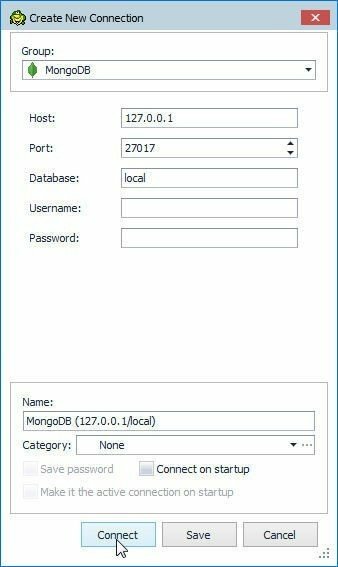 Download the mongodb-win32-x86_64-3.4.4-signed.exe application from https://www.mongodb.com/download-center?jmp=nav#community and double-click on the .exe file to install MongoDB. 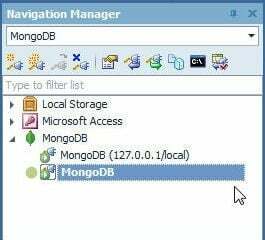 Add the directory path to the MongoDB bin directory C:Program FilesMongoDBServer.4bin to the PATH environment variable. 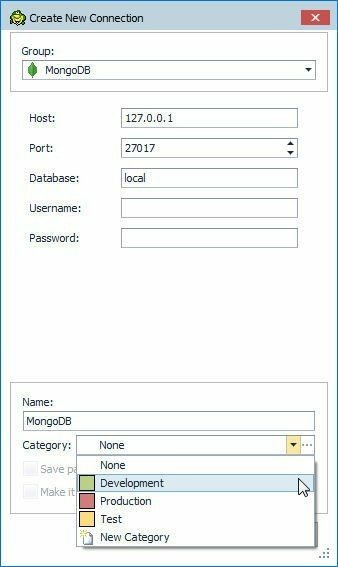 Start MongoDB server with the following command. 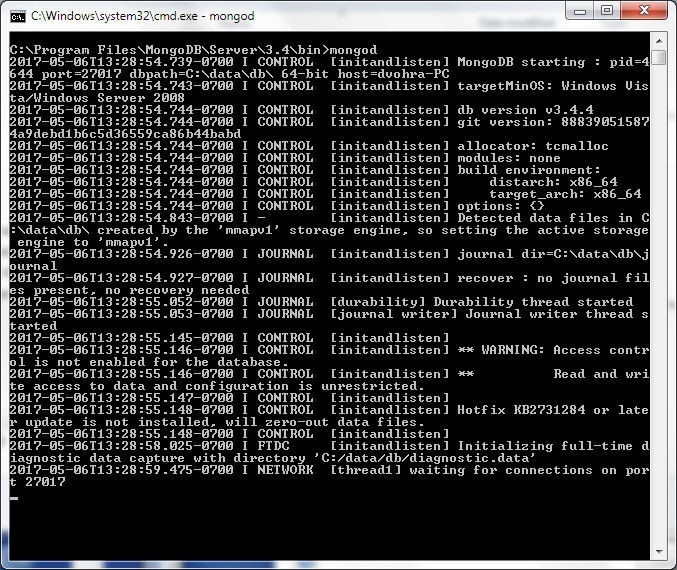 MongoDB server gets started, as shown in Figure 1. Create a MongoDB collection using the Mongo CLI, which is started with the following command. 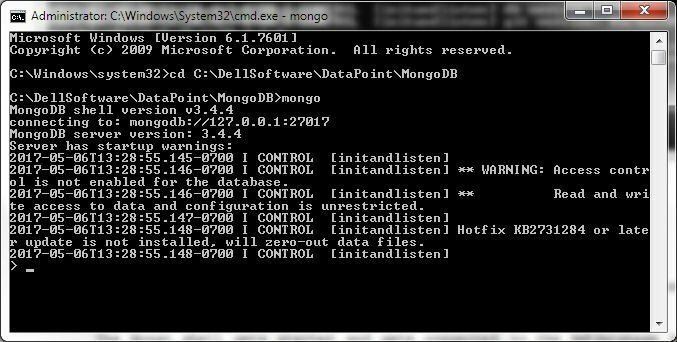 A connection gets established to mongodb://127.0.0.1:27017 and the Mongo CLI command prompt gets displayed, as shown in Figure 2. 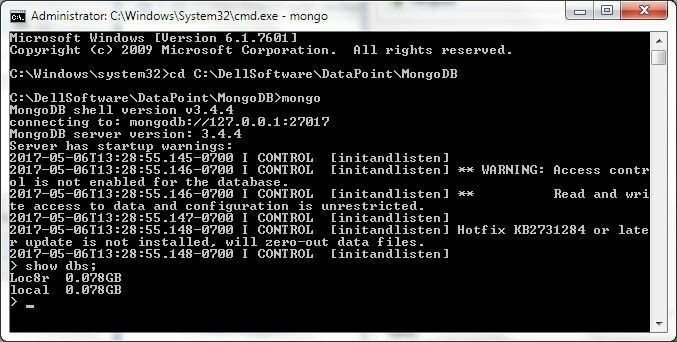 List the database instances with the show dbs command, and the local db should be listed as shown in Figure 3. 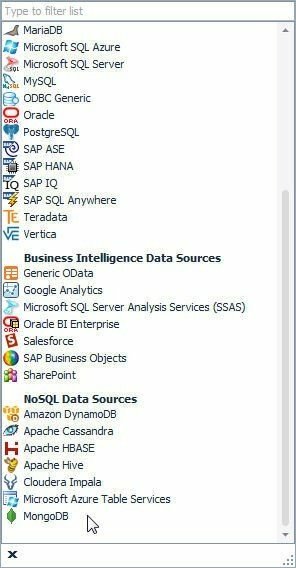 Select the local database as the current database with the use local command. List the collections with the show collections command, and the catalog collection should be listed as shown in Figure 4. Set the collection to use as catalog with the use catalog command. Add a few documents to the catalog collection. Each document stored in MongoDB must include a primary key field called _id of type ObjectId. The primary key field may be specified explicitly, as in the following command. If not specified in a BSON document construct, the _id field gets added automatically when a document is added. In this section we shall create a connection to MongoDB from Toad Data Point. Select Connect>New Connection in Toad Data Point as shown in Figure 5. In the list of data sources displayed, select MongoDB as shown in Figure 6. The Create New Connection wizard gets started, as shown in Figure 7. Specify Host as 127.0.0.1, Port as 27017, Database as local and click on Connect as shown in Figure 8. 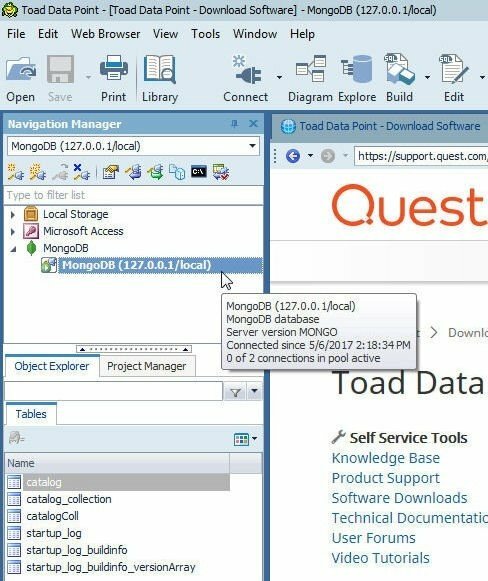 Toad Data point connects to MongoDB and performs an initial analysis of the content, such as getting column and data type information, as indicated by the dialog prompt in Figure 9. Click on OK.
A connection to MongoDB gets established and a connection node gets added to the Navigation Manager, as shown in Figure 10. 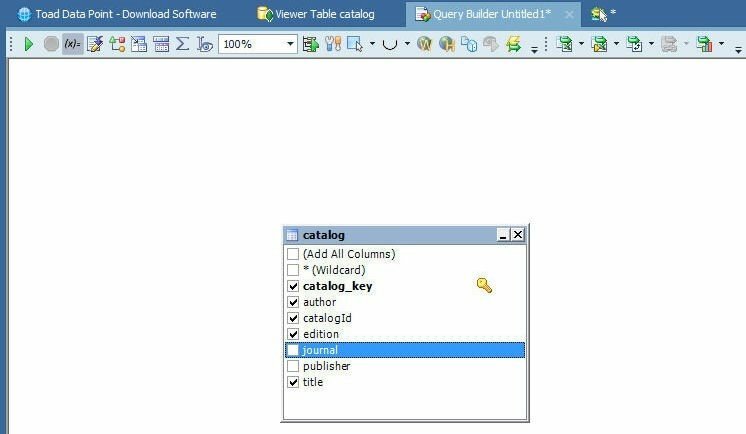 The Tables section in Object Explorer lists the tables (collections), including the catalog collection created earlier. The columns for the catalog collection include a catalog_key identifier key for the _id field in the collection, as shown in Figure 11. The DB Explorer in Toad Data Point provides an interface to explore a data source. 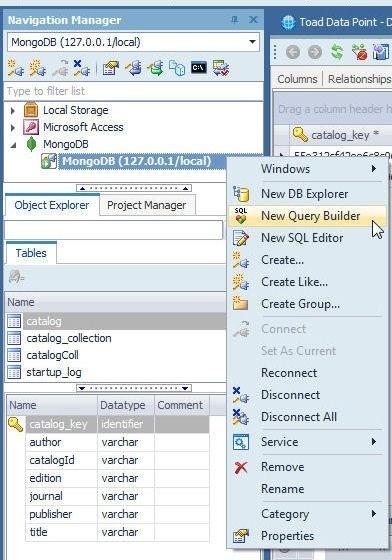 Select the catalog collection in Tables and right-click on the MongoDB connection node and select New DB Explorer as shown in Figure 12. The Columns tab is selected by default. 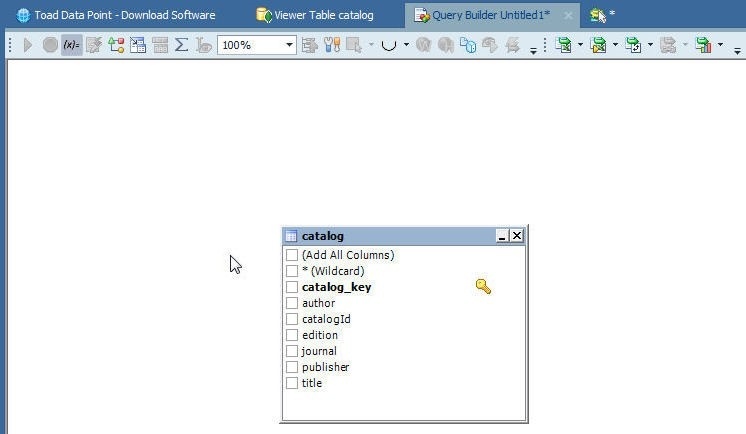 The different columns in the catalog collection, including information about column data types, whether a column is null and primary key, get displayed as shown in Figure 13. 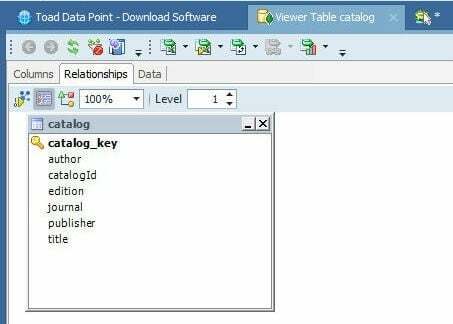 Select the Data tab to display the data in the catalog collection as shown in Figure 14. To display the diagram/s, including dependency tables, select the Relationships tab. A dialog prompt gets displayed to inform about the Diagram Dependencies, as shown in Figure 15. Click on OK.
A diagram for the catalog table gets displayed, as shown in Figure 16. Toad Data Point provides a Query Builder to query a data source. In this section we shall query the MongoDB collection catalog with the Query Builder. Right-click on the connection node and select New Query Builder as shown in Figure 17. The Query Builder wizard gets started, as shown in Figure 18. The Query Builder has three tabs: Diagram, Query, and Result. The Diagram tab, which is selected by default, displays the diagram of the table with selectable columns to build a query. Select the columns to be included in the query as shown in Figure 19. Select the Results tab to display the query as shown in Figure 20. 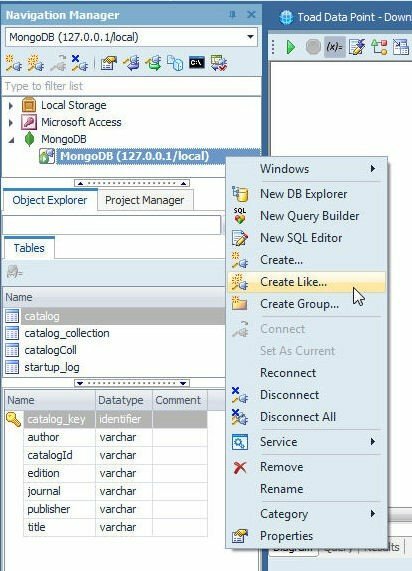 To run the query, click on the Execute the SQL Statement button as shown in Figure 21. Click on the Results tab to display the query results, as shown in Figure 22. In this section a query result shall be exported to an Excel spreadsheet. Click on the Export data to an Excel file icon drop-down list as shown in Figure 23. Select from one of the file formats, Excel File, to export to an Excel file as shown in Figure 24. The query result gets exported to an Excel file, as shown in Figure 25. To list the event log click on the View Event Log link. The event log information about the start and end time of the export, the duration taken for the export, the Excel version, the number of objects exported as shown in Figure 26. The Excel file may be opened at the link listed in the Export Finished dialog to display the export result, as shown in Figure 27. 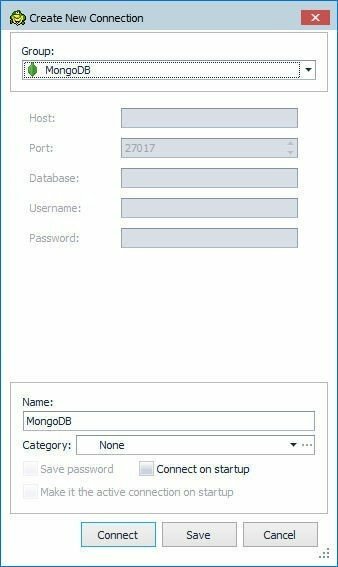 Multiple connections to MongoDB may be opened. To create another connection right-click on the connection and select Create Like as shown in Figure 28. In the Create New Connection wizard the connection properties are pre-specified. Select a Category from those listed as shown in Figure 29. Select Development as an example and click on Connect as shown in Figure 30. Another connection node gets added, as shown in Figure 31. 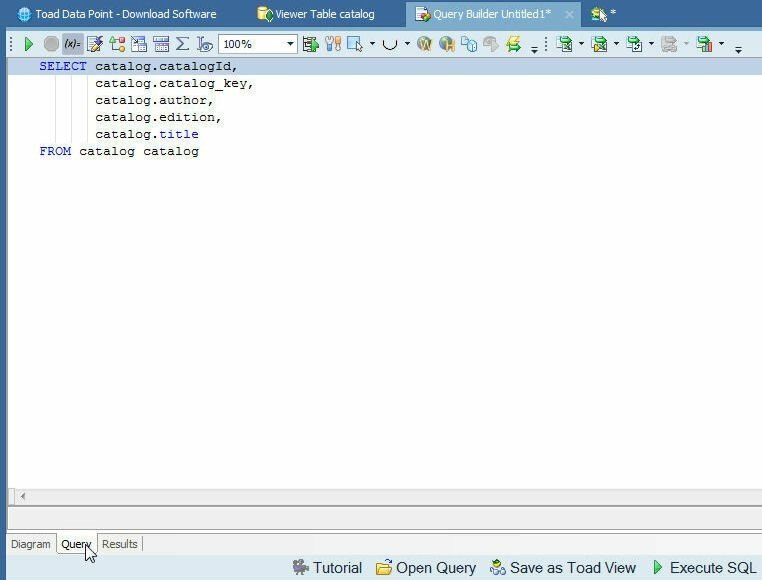 In this tutorial we discussed accessing MongoDB from Toad Data Point including creating a connection, using the DB Explorer to display the table/s data, using the Query Builder to query a MongoDB table, and exporting a query result to an Excel file.